Read the full statement from Cardinal DiNardo here. Read Archbishop Carlson's statement on the abuse report here. WASHINGTON -- The president of the U.S. Conference of Catholic Bishops Aug. 16 announced three key goals and a comprehensive plan to address the "moral catastrophe" of the new abuse scandal hitting the U.S. Church. Cardinal DiNardo, the president of the U.S. Conference of Catholic Bishops, Aug. 16 announced three key goals and a comprehensive plan to address the "moral catastrophe" of the new abuse scandal hitting the U.S. Church. He said the "substantial involvement of the laity" from law enforcement, psychology and other disciplines will be essential to this process. He also said that right now, it is clear that "one root cause" of this catastrophe "is the failure of episcopal leadership." In a lengthy letter addressed to all Catholics, Cardinal DiNardo laid out three goals just established by the bishops' Executive Committee in a series of meetings held early the week of Aug. 13. The goals were described as: 1) A full investigation into the questions surrounding former cardinal Archbishop Theodore E. McCarrick, 2) an opening of new and confidential channels for reporting complaints against bishops, and 3) advocacy for more effective resolution of future complaints. The first is a "full investigation" into "the questions surrounding" Archbishop Theodore E. McCarrick, a former cardinal and retired archbishop of Washington. He said the Executive Committee will ask the Vatican to conduct an apostolic visitation into these questions "in concert with" a group of laypeople identified for their expertise by the USCCB's lay-run National Review Board who will be "empowered to act." The three goals "will be pursued according to three criteria: proper independence, sufficient authority and substantial leadership by laity," he said. 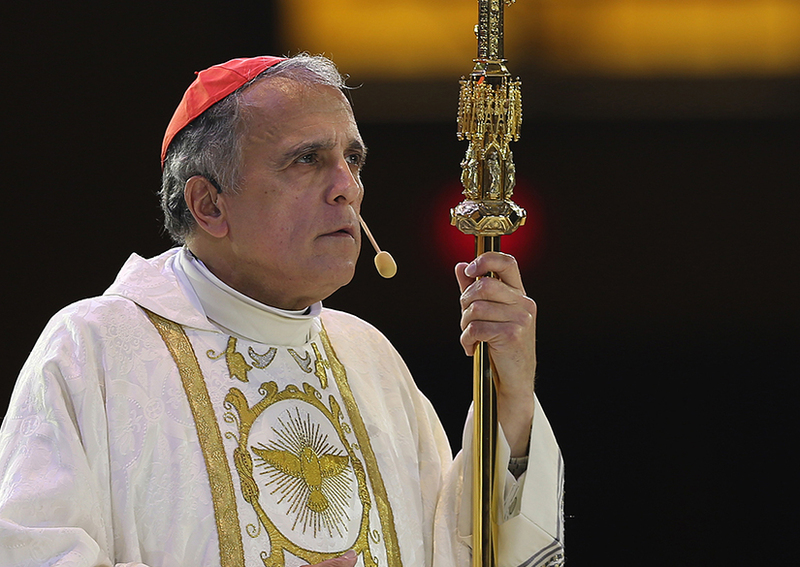 Cardinal DiNardo said the members of the Executive Committee "have already begun to develop a concrete plan for accomplishing these goals, relying upon consultation with experts, laity and clergy, as well as the Vatican." In addition to this being presented to the full body of bishops at their Baltimore assembly, the cardinal said he will go to Rome to present these goals and criteria to the Holy See, and to urge further concrete steps based on them." "The overarching goal in all of this is stronger protections against predators in the Church and anyone who would conceal them, protections that will hold bishops to the highest standards of transparency and accountability," Cardinal DiNardo explained. He elaborated on each of the goals he described, starting with the "full investigation" of the Archbishop McCarrick case and questions surrounding it. "These answers are necessary to prevent a recurrence," he said, and "so help to protect minors, seminarians and others who are vulnerable in the future." The bishops will "invite the Vatican to conduct an apostolic visitation to address these questions, in concert with a group of predominantly laypeople identified for their expertise by members of the National Review Board and empowered to act," he said. He said the second goal "is to make reporting of abuse and misconduct by bishops easier." "Our 2002 'Statement of Episcopal Commitment' does not make clear what avenue victims themselves should follow in reporting abuse or other sexual misconduct by bishops," he explained. The statement is in the bishops' "Charter for the Protection of Children and Young People," approved in Dallas in 2002, and revised in 2005, 2011 and 2018. "We need to update this (commitment) document," Cardinal DiNardo said. "We also need to develop and widely promote reliable third-party reporting mechanisms. Such tools already exist in many dioceses and in the public sector and we are already examining specific options." The third goal has to do with advocating for "better procedures to resolve complaints against bishops," he said. "For example, the canonical procedures that follow a complaint will be studied with an eye toward concrete proposals to make them more prompt, fair, and transparent, and to specify what constraints may be imposed on bishops at each stage of that process," he said. He also laid out the three criteria for pursing these goals: "genuine independence," authority and "substantial involvement by the laity." "Any mechanism for addressing any complaint against a bishop must be free from bias or undue influence by a bishop," he said. "Our structures must preclude bishops from deterring complaints against them, from hampering their investigation, or from skewing their resolution." Regarding authority in the Church, he said, "Because only the pope has authority to discipline or remove bishops, we will assure that our measures will both respect that authority and protect the vulnerable from the abuse of ecclesial power." About the "substantial involvement of the laity," he said: "Laypeople bring expertise in areas of investigation, law enforcement, psychology, and other relevant disciplines, and their presence reinforces our commitment to the first criterion of independence." In closing, he said, "I apologize and humbly ask your forgiveness for what my brother bishops and I have done and failed to do." "Whatever the details may turn out to be regarding Archbishop McCarrick or the many abuses in Pennsylvania (or anywhere else), we already know that one root cause is the failure of episcopal leadership," Cardinal DiNardo said. "The result was that scores of beloved children of God were abandoned to face an abuse of power alone. This is a moral catastrophe. "It is also part of this catastrophe that so many faithful priests who are pursuing holiness and serving with integrity are tainted by this failure." He said the U.S. bishops "firmly resolve, with the help of God's grace, never to repeat it." "I have no illusions about the degree to which trust in the bishops has been damaged by these past sins and failures. It will take work to rebuild that trust," Cardinal DiNardo said. He said the goals and plans outlined in his letter are "only the beginning." "Other steps will follow," he said. "I will keep you informed of our progress toward these goals." He asked U.S. Catholics "to hold us to all of these resolutions." "Let me also ask you to pray for us, that we will take this time to reflect, repent and recommit ourselves to holiness of life and to conform our lives even more to Christ, the Good Shepherd."